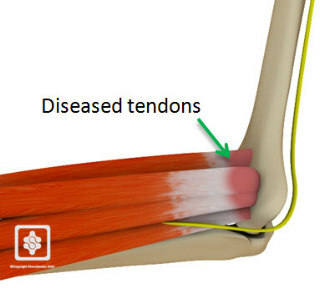 Golfer’s elbow is a chronic degenerative of a tendon of the inner side of the elbow. It is also known as ‘medial epicondylitis’ . 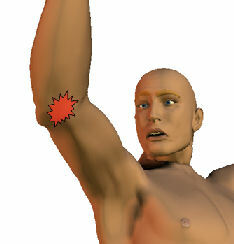 Pain over the bony prominence on the inner side of the elbow. The pain can extend down the forearm to the wrist and hand. The pain is made worse by bending the wrist and grasping objects tightly. There may be discomfort in extending (straightening) the wrist also, due to stretching of the affected flexor muscles. The type and duration of the treatment will depend on the severity of the condition. The treatments are similar to Tennis Elbow. For more detail click here. The first step in treating golfers elbow is to eliminate the activities that cause the pain, such as tennis or golf. Pain killers and anti-inflammatory medications relieve the pain and reduce the inflammation. A forearm strap can be worn just below the elbow to limit the stress on the muscles. Treating the area with an ice pack and performing an ice massage are also recommended. Physiotherapy to release the tendon inflammation and retrain the muscles with eccentric exercises. Injections have may be used. Steroid injections are the most commonly used injections, but they generally wear off after a few months and may need repeating. More recently Platelet Rich Plasma (PRP) injections have shown to be more effective than steroid injections, but are much more expensive. If the condition does not respond to the above treatments, surgery may be necessary. The surgery is usually performed as day case surgery. This may be performed by an open approach, percutaneous or arthroscopically (keyhole). There are pros and cons to each of these methods, but the results are similar. You will be able to start moving your elbow normally two days after the surgery, with 1 week off work. Full recovery may take three months. To prevent golfers elbow from reoccurring, it is important to make sure you keep the muscles strong by exercise and using the proper form whether playing sports or lifting heavy objects. Warming up before starting to use the muscle will also help prevent the condition. After exercising, you may want to ice and stretch the elbow and arm muscles.